Are you looking for the perfect item to give away as a door prize or gift for the upcoming holiday season? 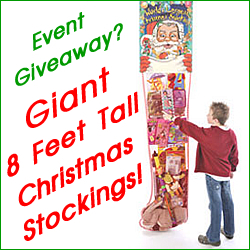 Look no further than these HUGE 8FT Christmas Stockings! 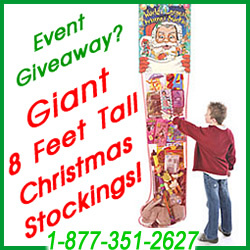 The Stocking is a ginormous crowd pleaser – its perfect to impress the crowds at your storefront, or bring in the traffic and shoppers that important time of the year. Filled with licensed toys, the stocking includes raffle entry forms and a raffle box for you to hold a HUGE holiday fundraiser! Call Cheryl Toll FREE Today at 1-877-351-2627 and tell her The Santa Guide sent you! PROMOTE YOUR HOLIDAY EVENT IN A HUGE WAY!